Meet Ari Partinen. He is one of the camera experts who are responsible for the Nokia N8, which came with a spectacular camera for its time period, the Nokia 808 PureView, which featured a stellar 41MP snapper on its back, and almost every PureView-equipped Nokia smartphone, such as the Lumia 920, 1020, 1520, and the Icon. All in all, Mr. Partinen is one of Nokia's gurus in the field of mobile imaging technology, but sadly, May 9 is his last work day at the Finnish company, which sold its Devices & Services division to Microsoft. But Ari Partinen won't remain unemployed for long. In fact, he has already settled for a new job. In Cupertino, California. That's right, one of Nokia's biggest experts in the mobile camera department announced that he will work for Apple from June onwards. This was announced by Ari Partinen himself on Twitter. He expressed his satisfaction of the outcome by stating that he will be starting "a new chapter in Cupertino". Hopefully, Ari Partinen's involvement with Apple will result into future iDevices with even better imaging capabilities. 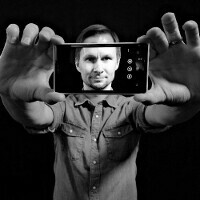 Partinen is not the first member of the team behind the PureView technology to leave the Finns. Back in November 2012, another prominent photo guru - Damian Dinning - kissed Nokia goodbye and moved to Jaguar Land Rover. Alas, it is pretty sad to witness that key experts are leaving Nokia, which was once the dominant player on the mobile phone market. However, times are changing and one should expect a high-ranking expert such as Ari Partinen to desert the sinking ship and look for better opportunities. What do you think of Mr. Partinen's transition from Nokia to Apple? Drop a line and let us know! Yet it works perfectly amazing! "mid-range specs"? The A7 is the best ARM processor in a device you can buy, or will be able to buy, until the A7x/A8 starts shipping, the screen is a one of the highest rated by Display Mate, the camera is one of the best rated by DxO photography, and the chassis is more expensive to make than anything outside the Vertu line. I would hate to see what constitutes high-end specs, but be sure to let us know when that finally hits the shelves. Yea....but all of those were the same things used in 2010...so none of that is "good". Plus, when you say one of the highest rated, it literally is the lowest among the high end of smartphones (but better than the mid/low level stuff). Also, Vertu SUUUCCKSS in all ways, including build quality. Comparing to them is literally saying you have no attention to detail and are severely influenced by marketing fluff. dam them Apple making the right move !!! They can't have pure view cameras. You're right, Apple focused in quality not quantity(pixel count). Why is it that Apple can't topple the 1020 in camera comparos if it's only an out quality? Because Nokia focused in both quality and quantity. So it can be done, just that you choose to hail a company that chooses not to. With the amount of money Apple has and makes, I am pretty sure they could easily make it happen. Unfortunately there is no consumer push from the docile Apple crowd so why would they (although, Nokia pretty much did without being prodded for it). And you look like you've ran out of jokes. Joke....? I thought he was having a stroke. Not very happy but I believe Nokia(MS) still has enough photo experts. There is just one thing about article, how is MS sinking ship ? I believe MS has enough money to run Mobile business for long time. I think he is leaving to quickly. yeah that sinking ship comment was really unnecessary. even their head also known as Camera Guru - Damian Deming left the company after 808.. point is no true "Nokian" likes Microsoft at all and hence they are leaving.. there are many more unannounced resignations soon to be followed.. Microsoft and eflop killed Nokia..
Nokia sold device business so they gone. I hope all nokia's engineers join nokia again whenever Nokia start new and fresh mobile business. Waiting to see what suri will do after 2 yrs. Waiting for Nokia back in mobile and make N-series N10 powered by Android. And nokia don't have to worry, because there r many smart people still there in finland. And, it starts. I said some time ago, much of that Nokia talent won't be working for Microsoft for long, if at all.